Waiting ... waiting ..... It has arrived! The dismantling of the remaining structures used by the US Army continues. Fred Folz was on the Hill last July and took a couple of photos, which Phil has posted on his website. The full story on the transformation was supplied by Andreas Gewinner and is presented here in English translation. An era is coming slowly but surely to an end on Schneeberg. Because the mountain’s “Sleeping Beauty” status is over – at least for the onetime US compound. When you look in one direction from the Backoefle atop Schneeberg’s 1050-meter summit, you see a massive, modern Bundeswehr structure and adjacent tower, which now serves a base station for cellular communications. 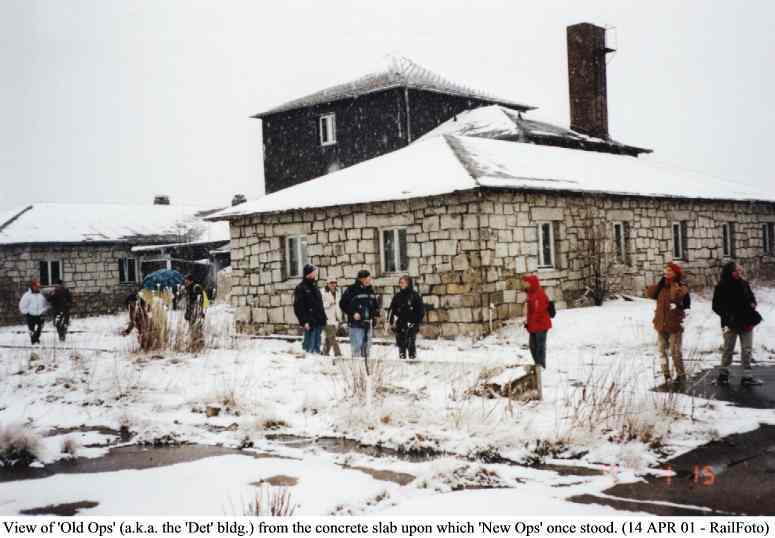 When you look in the other direction you see a much older triple-wing building, from which the US Army monitored and analyzed East Bloc communications for some 40 years. Time has stood still on Schneeberg’s summit for the past eleven years – interrupted only by the partial restoration of the area surrounding the Backoefle, which was reopened to the public in 1996. But even back then some of the buildings on Schneeberg had already disappeared. Unlike the Bundeswehr tower, the American buildings were continually rebuilt and expanded over the years. The natural stone and slate that adorn the exterior are typical architectural features for this region. The American buildings therefore do not look out of place. Nonetheless, the final bell has now rung for this outdated dwelling. The antenna bridge recently vanished, and now the building (old ops) itself is beginning to come down. The origin of the triple-wing building remains cloudy. Some say that it dates back to the late 30s or early 40s when the German Army occupied the top of the hill and erected a wooden tower and other structures, which have long since disappeared. But other sources assert that the buildings were first built by the Americans after the war. The latter is unlikely, however, in view of the architecture. The Americans occupied the summit of Schneeberg in May of 1945 immediately after the end of hostilities. From here they observed the troop movement of their then Soviet allies. At the beginning of the 50s the US compound was successively expanded. At the height of the Cold War some 40 soldiers under the command of a single officer were permanently stationed on the mountain. They lived in barracks below the summit where the current Bergwacht [mountain rescue] cabin is located. The Bundeswehr also set up shop on Schneeberg next to the Americans. In 1970 the Americans packed up and left Schneeberg. In 1975 they returned on a smaller scale to resume monitoring operations. At the end of the 70s and beginning of the 80s the compound was thoroughly renovated: new windows, new heating system, new kitchen. The temporary buildings from the 50s and 60s vanished. Even an indoor basketball court was erected. The concrete floor is still visible. Following Operation Desert Storm, the first Iraq war, the US Army shut down all operations on Schneeberg. Engineers removed all of the technical equipment at the end of 1991 and the beginning of 1992. Since then the building has remained vacant. Long-term plans call for all remaining structures right down to the concrete and asphalt surfaces to be removed from the former US compound. Only the fence will remain standing. In contrast to the adjacent former Bundeswehr compound, the area within the fence will be left to develop naturally, free of any human influence. The entire summit of Schneeberg has been a protected nature preserve for over 60 years. This is why the buildings, which were still in very good shape when handed over by the Americans, could and cannot be put to reasonable use. It is not known if anyone ever sought to preserve the buildings for use by, for example, the Bergwacht. This would have eliminated the need to build a new structure slightly farther down the hill. While no one would probably shed a tear if the Bundeswehr’s structural monstrosities were to come down, not everyone is glad to see the older buildings with their rich and varied history disappear.